Lasagna in less than 45 minutes and only one pot to wash. I'm not kidding! I love lasagna but there is definitely a lot of work that goes into it. Making the filling, making the sauce, mixing the cheese, boiling the noodles, putting it all together and then waiting at least an hour to eat it. If you have a lot of time it's definitely worth it to make lasagna because there's nothing as comforting as baked, cheesy pasta, right? And there are some days when I crave being in the kitchen - it's therapeutic - so lasagna is a great meal to make on days like that. But really, unless you can prep everything early, who has the time for that on a weeknight? 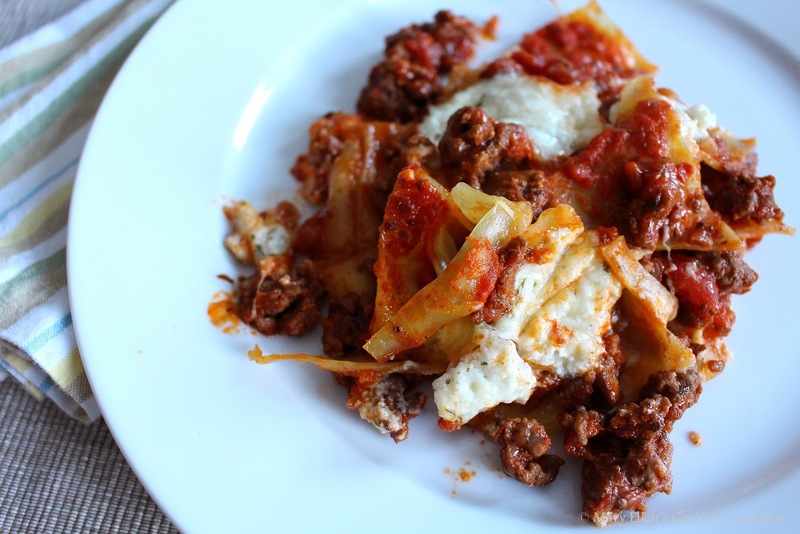 That's why this skillet lasagna is THE ANSWER. Between getting all the ingredients out, chopping the onion and garlic, making the sauce, layering the lasagna and baking it in the oven, I had this on the table in just under 45 minutes. And of that time only about 18 minutes are spent actively doing something. Even better, my husband who isn't a big lasagna fan really liked this, and said he liked it even better than traditional lasagna! My 4 year old took the leftovers to school for lunch the next day and asked if we can have it for dinner every night. I'd say that's a success. Add the diced tomatoes and tomato sauce and simmer, stirring occasionally, until slightly thickened, about 5 minutes. In the meantime, mix the ricotta, most of the mozzarella, half of the Parmesan, the dried parsley, salt and pepper in a small bowl. Cover with foil and bake 22-25 minutes until the noodles are soft and the entire thing is hot and bubbly. Let it sit for just a few minutes before serving. Glad you enjoyed it! Such a simple idea, can be modified in so many ways!! I have added sausage to the beef, and played around with different cheeses and seasonings. I've even done a chicken/southwest kind of riff. ALL fabulous, when it's just one skillet!